In this newsletter, you can read about three newly launched products that we will promote at SPIE Defense, Security + Sensing. 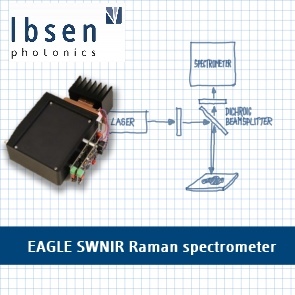 The first product is our compact, robust, high resolution EAGLE SWNIR spectrometer for Raman systems. 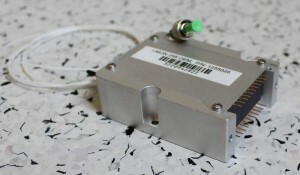 The second product is the new high efficiency Raman NIR Gratings which are ideal for compact spectrometers. Lastly, we will be presenting our new family of I-MON Interrogation Monitors, consisting of a USB, an OEM, and a High Speed version. The EAGLE platform consists of compact, robust, high throughput, and high resolution spectrometers, well suited for OEM integration into compact and/or process control Raman systems. The high throughput is accomplished through a combination of an Ibsen Photonics unique, polarization insensitive, surface relief transmission grating, a design with only two lenses rather than mirrors or multiple lenses, and a 3 mm tall slit matching the 3 mm tall detector pixels without imaging errors. Optical resolution can be as good as 4 cm-1 and the wavelength range of 822 – 978 nm enables for instance 200 – 2100 cm-1 or 600 – 2500 cm-1 Raman ranges with a 830 or 785 nm laser excitation, respectively. EAGLE supports both cooled and un-cooled BT-CCD detectors and can furthermore be fitted to most scientific cameras commonly used in Raman spectroscopy. As a newest addition to our broad portfolio of gratings for telecom, laser and spectroscopy applications, Ibsen has developed a grating specifically for Raman spectroscopy – suitable for both 785 and 830 nm excitation laser wavelengths. With almost 90% average throughput over the 785 – 1065 nm wavelength range, and extending up to 1100 nm, the grating enables unbeatably high throughput for a spectrometer built around this grating. This performance is achieved by combination of Ibsen’s advanced grating design capabilities with proprietary Holostepper™ patterning, which provides high resolution, high efficiency, low noise gratings at the cost level of traditional reflection gratings. 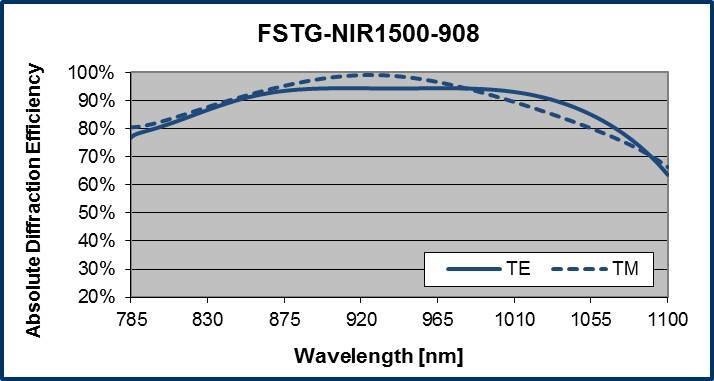 The 785-1100 nm Raman grating is stock available, while Raman gratings for other excitation wavelengths can be provided on custom basis. Don’t hesitate to contact us for discussions on your grating requirements. OEM – Our successful I-MON 256 OEM is getting a new family member: the I-MON 512 OEM with broader wavelength range. You make the electrical interface, and the pin-compatible diode arrays allow you to drive both versions with the same electronics. USB – We make the electronics interface and pack the devices in a rugged EMC shielded housing, as we did with the well-proven I-MON 512E. A completely new, cost-efficient series including the I-MON 256 USB and the I-MON 512 USB. Measurement speed up to 6 kHz with the usual sub-picometer wavelength-fit resolution. High Speed – Adding also an I-MON 512 High Speed to the family, GigE interface, measurement speed up to 17/35 kHz – again with the usual sub-picometer wavelength-fit resolution. Ibsen Photonics will be exhibiting at the SPIE DSS show in Baltimore from May 6th to 8th at booth # 1159, where we will be present and ready to discuss these new products with you. So come by our booth for more information – we look forward to seeing you there!